I'd say Key Box beach is GOOD! Many days I find 5-9 pieces of well frosted and smooth edge pieces. Some days I only find 20 to 30 pieces. Some days I find 60-70 pieces. Most are amber/brown, white and kelly green. I have found quite a bit of sea foam green, a beautiful piece of cobalt blue and a lavender piece. Key Box is a fishing beach, not many tourist walk it. 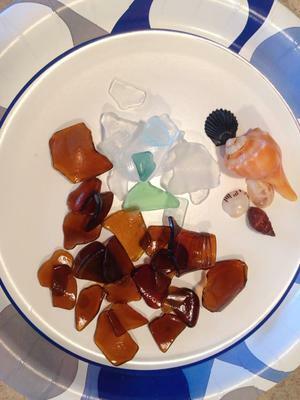 I go 2 hours before low tide and find that is the best time to find sea glass. Have also found some pottery, 2 pieces that I have made into pendants. Wife and I drove out here to check out a new site for sea glass. Found over 30 pieces in a little more than an hour. Two were special - one lavender and one turquoise. Both larger than a quarter and both well frosted. Will definitely return for longer searches.